You can join the many voices that help the world understand more about how work with animals is so important. Start sharing the truth about the importance of animals in biomedical research by raising your voice today! I’ve benefitted from animal research. *You give permission for us to share your story and/or picture when clicking the “Take Action” button. Your stories will be used on our website and in other communications to help others to raise their voice and save lives. 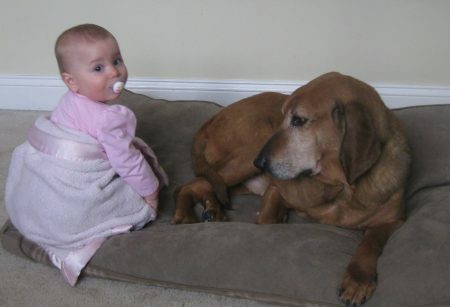 Pacer, a retired research dog with Amelia, a baby needing allergy medicine.